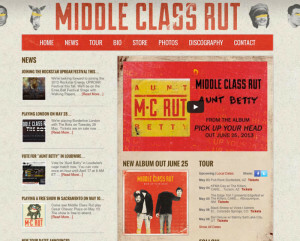 Last month we launched a new website for the alternative rock band Middle Class Rut. Our friends at Relentless Artist Management asked us for help when it came time to put together a modern, useful Content Management System based web site so that they can easily manage their band’s web presence in an efficient way. The site is based on art from their latest album. If you’re into bizarre music videos then check out their latest called “Aunt Betty”, its a doozy.